I am not a gamer. All those newfangled surround sound polygons make me want to hurl. 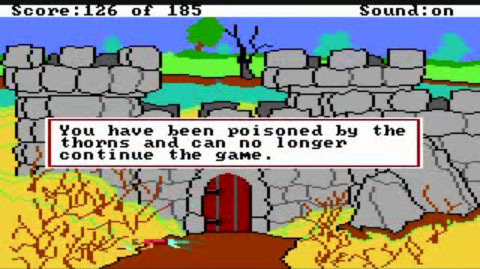 But as a plucky youth with a computer geek dad, I had the fond and formative experience of devouring Sierra computer adventure games, especially the King’s Quest series. 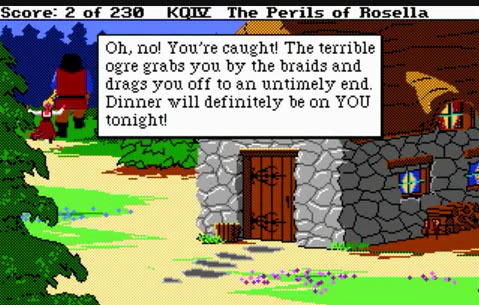 Ah, King’s Quest! Instilling bad puns and ogre fear in children of the ’80s everywhere! Reliving the King’s Quest deaths with nostalgic glee, I can’t help but recognize that, given the care in capturing every death in a wide range of titles, even and especially when that death is terminally boring, Ways to Die videos are more than just for the laffs and (perhaps) reminiscing the age of less gruesome gameplay. It is also about documentation — the compilation and collocation of information, even if that information seems trivial. How is it important or useful? I’m not exactly sure. And yet, I approve — not just for the jolt back to childhood, but the belief that in some weird way, this is a cultural and generational transmission. Back in the olden days, you could die from a scratch from a scraggly 8-bit scribble, and it would devastate you. And like the games of today, discovering all the creative and absurd ways to off yourself is just as challenging and fun as avoiding it. Are these expressions of thanatos, exploring death and dying in a safe environment? Or perhaps just getting one’s money worth? After all, once immersed in a spellbinding narrative and mesmerizing virtual world, you never want the game to end — even if that means finding every way possible to die in it. 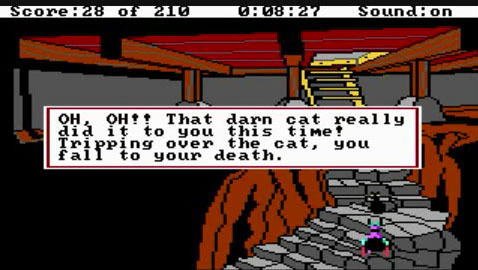 Posted by Meg Holle in Death + Humor, Death + Popular Culture and tagged digital archiving, games, thanatos. Bookmark the permalink.